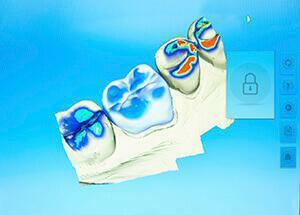 Many patients are unaware of how much impact dental technology has on their quality of care. While you may never notice the difference, state-of-the-art technologies from MJM Family and Cosmetic Dentistry make dentistry services more comfortable, quick, and effective. Before your first appointment, feel free to explore the information below regarding our modern dental techniques and technologies or contact us any time with questions about how our advanced technology can make your visit better. Digital X-rays are an incredible improvement over traditional film allowing Dr. Murray to eliminate tedious darkrooms and hazardous chemicals in favor of a convenient, high-tech experience that’s faster and safer than ever before. Our Scan X® Digital Radiography System captures detailed images of your smile and transfers them to our computer system within seconds for easy viewing and diagnostic use. Radiation use is decreased by up to 90% with this technology as well! For more complex services like dental implants, Cone Beam technology is also available to create 3D X-rays that ensure the most precise treatment process possible. With the help of DIAGNOdent, detecting decayed areas of teeth for treatment is easier than ever at MJM Family and Cosmetic Dentistry. Our team members will review your smile with fluorescence technology, revealing even small cavities that aren’t visible yet on the outer enamel in a gentle, non-invasive manner. This allows Dr. Murray to preserve more of your natural tooth structure and help you maintain a stronger smile overall. With the NV soft tissue microlaser, we offer a number of traditional dental services with reduced discomfort, bleeding, and healing time. We most frequently recommend NV laser treatment for those patients who need advanced periodontal therapy – scaling and root planing. By using a microlaser rather than the traditional scalpel and sutures, patients reduce risk for reinfection and improve their odds for more comfortable healing time. We may also use soft tissue lasers as part of crown lengthening, gum recontouring, and other procedures. We utilize digital impressions to ensure that every patient receives the most comfortable and precise impressions leading to superior restorations. Additionally, we can immediately transfer the digital files to our lab significantly reducing turnaround time for custom restorations.